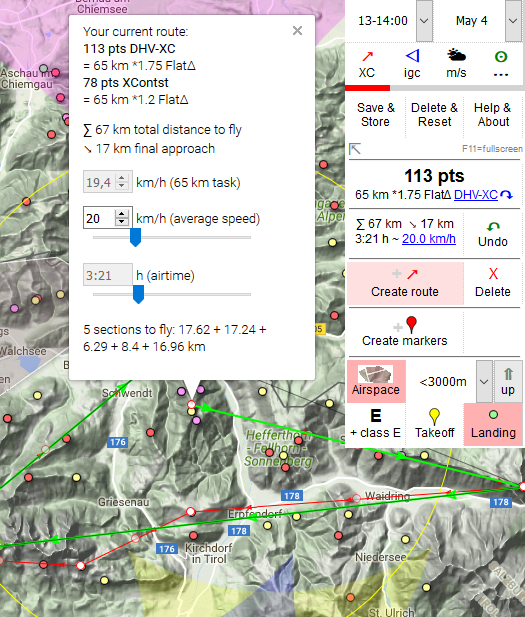 ThermiXC is a non-commercial project to develop a XC planning tool for glider pilots. Use it free of charge and without registration! The focal point is thermal data. The Thermix XC Planner shows you the results of multiple thermal models and igc track evaluations. You want to find new routes, leaving the highways? Check the TherMap Overlay, this model uses topografical data and is independent of igc tracks! To find the well-known thermals at popular sites or XC routes, refer to the kk7 model, including the skyways. In order to find best thermals, depending on the wind direction, use the DHV model. For details, see thermals section below. Evaluate your routes, tasks and tracks, and follow your friends on the SPOT LiveTracking. Drop a route, task, or track file, or a SPOT list on ThermiXC, check where you might have missed the best route. No user data is collected, no cookies are transfered to our server. But ... be aware that ThermiXC is based on google api products, which collect information about their users. We recommend to use Firefox or Chrome, and to... use the most recent browser release. Internet Explorer and Safari should work at least 95%. Thanks to our contributors for providing thermal, site and airspace data free or charge. Data is provided and displayed without warranty. Play with thermal filter settings and you will get used to the colors soon! If you see no thermals, try the waypoint view. If you see very much thermal waypoints, try the heatmap view. But keep in mind, that data are only available in certain regions. Play with the zoom level! Level of detail of thermal data and some other tool functions depend on... the zoom level. If you see only very few or too many thermals, try to toggle heatmap and waypoints view, or to adjust filter conditions or zoom level. Be careful with DHV-XC thermals, set filter conditions appropriately when switching between zoom levels. For details, see thermals section below. "Data may still be loading": try to reload ThermiXC after some time (press F5 after 5 sec or use the reload control field), or change filter conditions or zoom level. This technical problem depends on the amount of data loaded, the network connection, browser type and hardware. If you want to see all thermal models at a time, and include takeoff, landing places, and airspaces, this will be too much. "Mouse over" the control panel and hold on 1 or 2 seconds ... to display a short "tool tip" about what happens if you click this panel field. The info window shows coordinates, altitude, distance to the most recently opened info window (marked with a blue marker on a PC), and specific information and functions. For example, search for xcontest flights near to this point. 1-click-mode: if the XC Tab option "Create route" and/or "Create markers" is on and you click the map, NO info window will pop up, but a route waypoint or a marker will be created immediately after clicking. Check airspaces when planning a route - but be aware... that airspace information displayed in ThermiXC is for information only, and may be not accurate or out of date. Data is provided for non-commercial use only, free of charge and without warranty by © John Leibacher, soaringweb.org, © DHV e.V., © OpenAIP.net, © airspace.xcontest.org, . Some data used comes from openAIP or soaringweb.org. Visit openAIP.net or soaringweb.org and contribute to better aviation data, free for everyone to use and share. Always consult official soures about active airspaces and restrictions before you start your flight! Competiton score of your flight will be shown in the XC Tab. Click on the score to switch your scoring rule (DHV, XContest,..) or to turn it OFF. The flight plan summary below the score shows distances, final approach, airtime and speed. Click here to modify speed or airtime. You might save your plan and SPOT list as URL or file, multiple file formats are supported. Share the URL or file with your friends. If you save your plan as URL, ThermiXC will reload with this URL. Don't forget to save this URL after that as bookmark or to the filesystem! To transfer your markers and route to your GPS, save the plan as file. The flight plan: a „plan“ has a name, contains your markers and the current route, and the view date and time. Synchronize your bookmarks with your PC, tablet and smartphone, ... use the standard capabilities of your browser. Plan your flights on the PC, review or modify the plan on your smartphone later on your holiday trip, and store waypoints to your XC App like XC-Track. 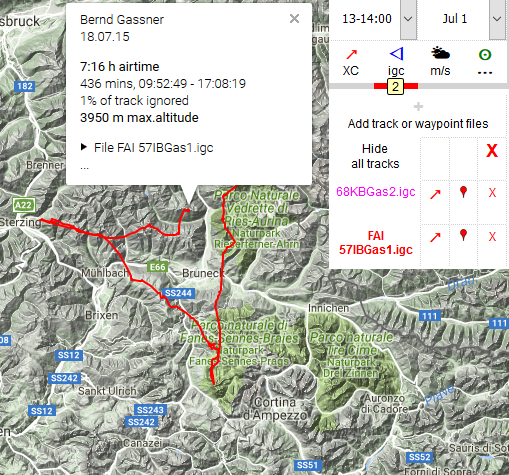 No need to copy "gpx" or "wpt" files from the PC to your smartphone. 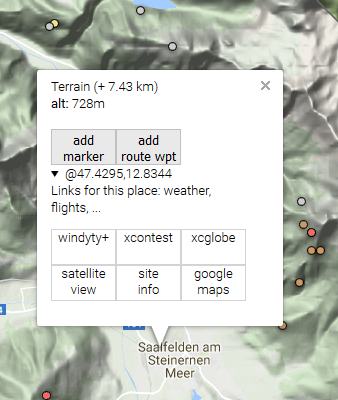 drop igc, gpx, wpt, cup, tsk (SKYTRAXX 3.0), xctsk (XCTrack), txt (SPOT lists) or kml-files on the map, or select the igc Tab and click "Add track or waypoint files" to draw tracklines, routes or waypoints contained in those files. You might also drop URLs (from your browser adress field, bookmarks or links) to ThermiXC plans, windy.com, SPOT Shared Pages or here.com satellite pictures on the map. Note: Filename suffix is important! SPOT LiveTracking requires no registration in ThermiXC but a SPOT account and public "SPOT Shared Pages". 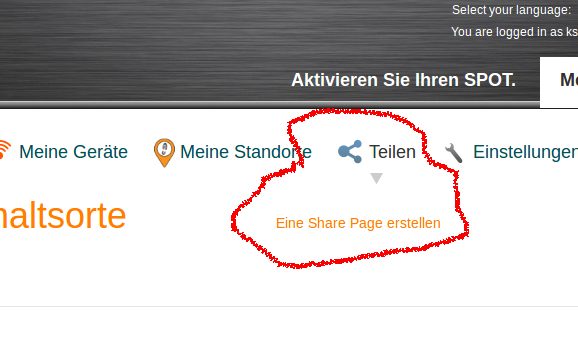 click "Share" > "Create a Shared Page"
choose "Make Shared page public"
Ask your friends to send you their Shared Pages URLs, test them and create bookmarks. copy the link text to a simple text file (Notepad, or a Texteditor-App like QuickEdit) or to a spreadsheet (csv) (Excel, LibreOffice: store the file as csv, separated by tabulator or semicolon). Create only one entry per line, file suffix must be .txt or .csv ! if you've created a txt file, drop the file on the map (drag&drop) or open the file with "igc-Tab": "Add track or waypoint files"
the names of your friends and the date and time of the most recent trackpoint are now listed on the igc-Tab along with other tracks and files. Click on the names to get more details, messages, altitudes (SPOT Gen3 only) and battery state of the sender. save and share the SPOT list as URL or txt file, click "XC-Tab": "Save & Share"
Small screen? Menus and info windows don't fit well... on the screen: if you open an info window on a small screen device, the menu will disapear (other than on your PC). You might also swipe the menu to the right to close it temporarily. In this case, an info window contains two control fields at the top right corner: the first one (→☰) closes all info windows and reopens the menu most recently used. The second (x) just closes this info window. Or click on the right screen border, or swipe from the right to reopen the last menu used. Create precise waypoints on a touchscreen... Instead of clicking directly on the map, move the map underneath the pin of the green marker, and click the marker's pin. The new point will be created exactly at the marker's pin. TherMap: thermal quality computations based on date, time, heat accumulation, slope orientation and inclination. Weather data and valley wind systems are not included. I found TherMap especially useful for new routes, which follow no highways, since no igc data is used! But: be aware that this overlay is based on static, topografic data. It really helps to read a map, but does not add any information. So do not stop thinking if you find a red spot on the map, just look at it like a sunny slope in front of you on a xc flight. 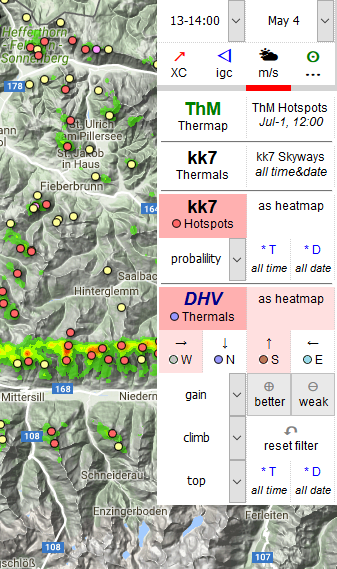 TherMap in ThermiXC is currently only available for the Alps, Apennin and Pyrenees. KK7 Hotspots are based on igc tracks, like DHV-XC. Evaluations focus on probabilty, date and time, and use the same database known from the "skyways"! Data are availabe for many regions, including some flatland spots. If you see no data, first check your filter conditions. Then toggle "heatmap" and "waypoint" view. If you still see nothing, check the time wildcard (*T), or try date wildcard (*D). If you see nothing, then we have no data there. DHV XC thermals are also based on igc tracks, and can be filtered by wind direction and thermal strength, time and date. Be careful zooming in and out without proper filter conditions, especially when *D wildcard is checked (ignores date, and returns a lot of data). Currently there are 600000 thermals avaliable! In the case data are not loaded properly, change the filter conditions and temporarily disable DHV XC thermals and Airspaces. Note that clicking on DHV-XC thermal waypoints only works at higher zoom levels for perfomance reasons. If you see no data, first check your filter conditions, then toggle "heatmap" and "waypoint" view. 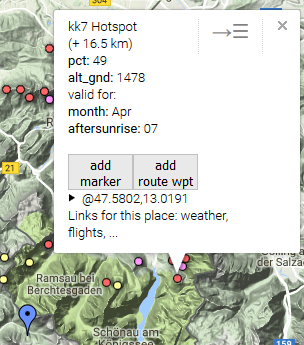 See description for KK7 Hotspots above.